I started working on this yesterday, at the same time as I was having a Yard Sale that turned out to be a bust. It had rained Friday night, and although every day this past week, including today, has been beautiful in the morning, yesterday it was wet, cold and windy. So my Yard Sale became a Porch Sale, and my loom is in the front room just inside the house so I could watch the porch while I dove into this piece! 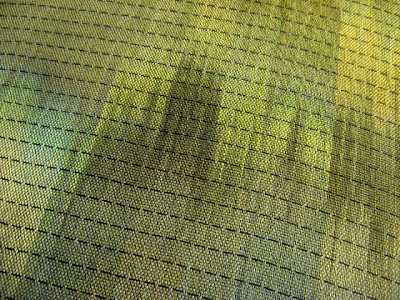 I wove up a few inches with the painted silk weft I had intended to use, but I didn't like how it looked. 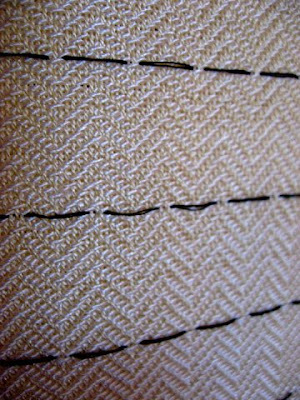 That piece was going to be plain weave (tabby), as well. So I started over with black cotton for the weft, and now weaving the network twill that the warp is threaded for. I'm really happy with it, it's going to be a beautiful piece of cotton fabric to work with. The second piece, which was going to be black tencel on black cotton, instead will be the painted weft on black cotton, and treadled differently to create a network pattern distinct from the current one. My black on black piece will just have to wait for another time. I've got two interesting new projects on my loom now. 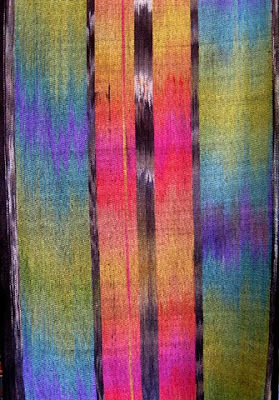 This is a painted warp piece, only I started with black mercerized cotton and discharged it with bleach as though I was painting it with dye. I'm really interested in the possibilities for discharging and this is one of my initial experiments. 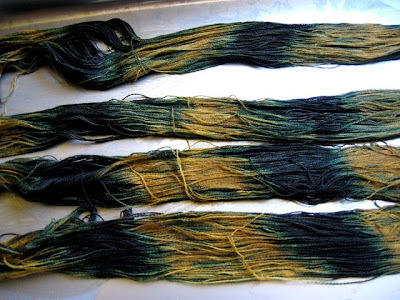 I'll be using that dyed-discharged silk weft in black/green/gold that I posted a photo of a few posts ago, so this woven substrate should be really interesting. The second piece on this warp will be all black -- the cotton warp woven up with black tencel, in a networked twill pattern. Ever since learning about network drafts, through Alice Schlein's incredible work, I've wanted to try it. Unfortunately having only 8 shafts seriously limits what's possible with network drafting, but I'm hoping to push the edges with what I've got, over time. 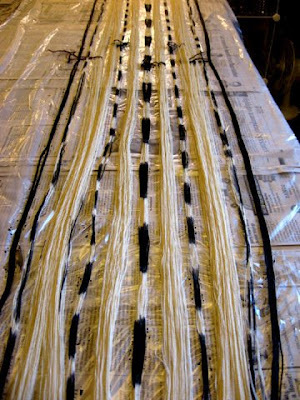 At any rate, my plan is to weave a length of black fabric in two fibers, then discharge shibori the piece, although I'm not intending to weave in the shibori threads. I don't have enough shafts to do that as well as the network draft. I'll start weaving the first piece tomorrow and am looking forward to it! I love these watery greens and teals! Just off the loom, washed and finished, ready for the shibori step. I already have this piece named, but want to see how it turns out in the end. Looking forward to working on it. And here's the ikat warp painted piece. Gorgeous silk in to-dye-for colors. I think what I like best about this piece is that there are "flaws" in it -- painting boo-boos, a few threads in the middle on the left that got misplaced during painting so they're out of sequence with the other threads in that stripe. I'm finding that my so-called mistakes, which are really serendipitious occurrences, spark ideas for things I want to do on future pieces. How interesting! Mostly I'm liking that I'm giving myself permission to be human, not letting these imperfections stand in the way of my forging ahead. The very best part is that I love warp painting, love the finished fabric, love weaving painted warps, and there's most definitely a lot more of it in my future! This is the second piece on the "new" warp I'm weaving up. 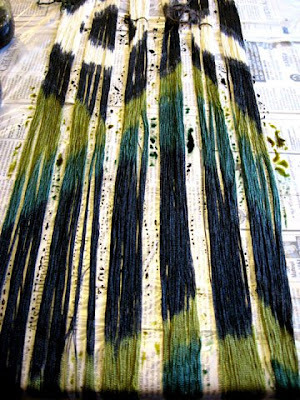 I completed the first piece this morning -- a painted silk warp of watery greens and teals woven with an olive green tencel weft, which I'll show you when I've taken it off the loom. 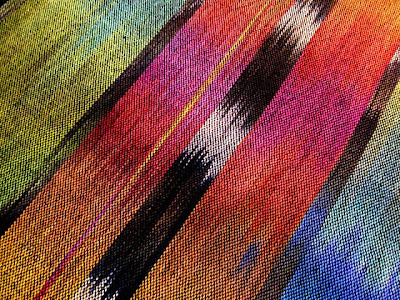 This piece, here, is a recreational weaving piece, meaning I'm planning to hold on to it and am merely weaving it for the pleasure of making something beautiful to hang in my home. 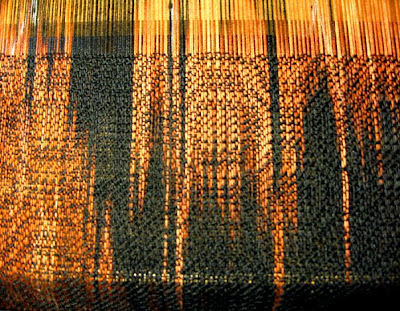 The weft here is a black 20/2 silk I dyed over the weekend. The photo doesn't do it justice. Today I've been weaving, nothing else fiber related. It's one of those days when my motivation isn't up to my personal standard, but I'm getting stuff done nonetheless. Working myself up for more later this week. 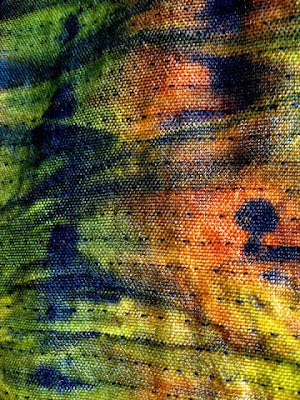 This is a silk woven shibori piece that I wove early this year but just got around to dyeing. 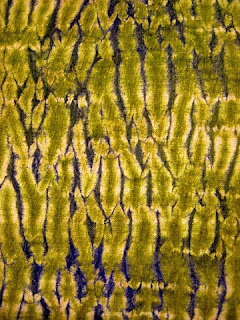 I've been thinking about it for weeks, now, and finally "under" painted it yesterday -- that's when I paint dyes on the woven fabric before gathering and doing the final dye to bring out the shibori patterns. I painted it with the same cool colors I used on the painted warp I did last week -- apple green, green, turquoise and violet. The colors were great but I didn't at all like the way they looked applied to the fabric. I think this was my lesson in hand painting a big piece (this one's 18 x 90" or so), that it's difficult to do successfully, at least with what I had had in mind originally. Well, I dried the fabric last night and thought about it, and pondered my next move, and finally decided that I'd discharge the whole thing this morning. I used thiox and immersion discharged the entire piece. Discharging is removing the color and there are several chemicals that can be used. I chose thiox (thiourea dioxide) because it is safe for silk (whereas chlorine bleach, which works well on cellulose fibers, will destroy silk if not handled extremely carefully). But the thiox didn't remove all the color -- the originally naturally white silk was now a light orange yellow. Although I considered returning to some of my original color scheme, I quickly abandoned that in favor of colors that would be compatible with the now-yellow orange silk. I chose the same apple green as before, because it had a lot of yellow in it already, plus an orange brown. After washing and neutralizing the fabric with mild soap and vinegar following the discharge bath, I scrunched it up horizontally and fit it into one of my dye pans -- those stainless steel buffet table hot pans, which I use over a deeper pan like a double boiler...works magnificently for dyeing fiber and yarn that have had dyes applied directly rather than by immersing in water. Then I painted the new colors on, and lastly applied some black dye with a pointed squeeze bottle. Long story long, the results are at top of this post. I'm really happy with it at this stage of development. And I haven't even gathered the fabric yet!! Sometimes artists have to have cojones -- even us women artists! This just in...an experiment from late yesterday, that I left to dry overnight. 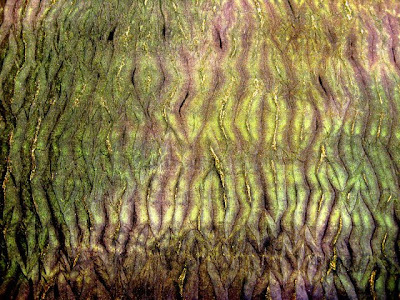 A small piece of habotai silk hand stitched for mokume shibori (mokume = wood grained), painted with dye two colors of green before gathering, left to dry, gathered, wetted out, overpainted with purple dye on both sides, then painted ridges of one side with thinned metallic fabric paint. Awesome, if I do say so myself! 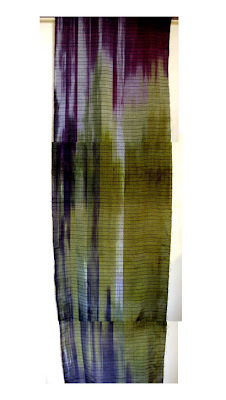 These are two views of the silk chiffon scarf I dyed and painted this week, for the Surface Design Association auction. I love the way it turned out. Although there are more things I could do to it, I've done enough. It's beautiful enough and I'm happy with it. Drapes nicely and feels good too. I'm sure whoever buys it at auction will love it. Enoughness has been an issue for me as I move forward into new artistic areas. As in, knowing when to stop. Being comfortable not using every technique in my toolbox, or even many of them on one piece. I'm thinking, less is more. Stop when I like it. Stop trying to fix it if it ain't broke. Know when to let it be. This is good life-lesson material for me. Kind of like "letting go and letting God." This is about being happy with what I've done without having to continually tweak it, trying to make it even better. I've tried so diligently in life to make things better for myself, in every way. It's exhausting. I'm doing all I can on so many fronts, holding the wolves at bay as it were. I think I need to let go and just totally immerse myself in the process of living without having to feel unduly responsible for the outcome. Because it's out of my hands. There's only so much I can do, and then it's up to the Universe. Ah, that supreme act of courage and faith, right in front of me, yet again. The Humboldt County Fair is over, and I scored ribbons on 27 of my 31 entries! About half those ribbons were First Place Blue Ribbons. Many of the finished items and skeins I've shown you over the past months here on my blog, were first-place winners. But what to do with all those ribbons that I win every year? Over the years I tried different ribbon management strategies -- methodically marking the back of each ribbon with the year and name of entry, attaching the ribbon to the skein or finished piece and displaying them in my studio, pinning the ribbons to a bulletin board in stacks, by year won -- but to be honest with you, any more I just toss them out. Don't get me wrong, it's absolutely wonderful to win ribbons and the associated kudos. But how many ribbons can you have, in reality? They're the same ribbons every year, I kept them in a box for a while, but decided long ago that they're just more stuff gathering dust. The only ones I'll keep anymore are special ribbons -- Best Of's and the like. I did win a Best of Category this year, but the ribbon was missing when I picked up my pieces earlier today, so the Fair Coordinator will have to send me one when she receives replacements. Anyway, another year, another haul of winnings! 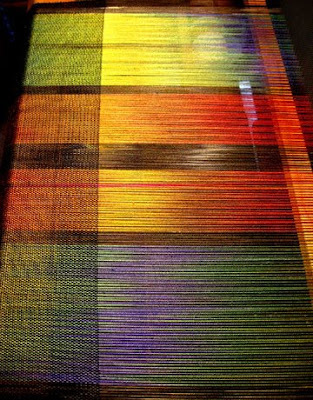 I'm warping the loom with those two painted warp pieces. 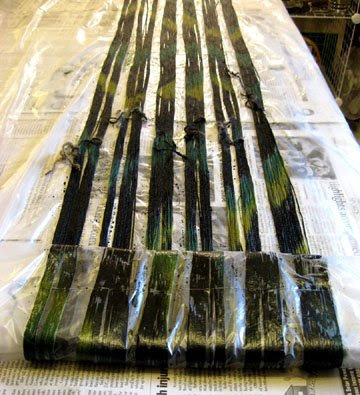 The photo above is of the warp I was intending to weave up with the black-green-gold weft I discharged last week. But after seeing how beautiful and watery this turned out, I've changed my mind and will weave it with an olive green tencel. And it will be a woven shibori in a pattern I've wanted to do again since I did it the first time, last year. The second painted warp piece in this duo was done to look like an ikat piece, with colored strips and black/white stripes. Here's that section of warp on my loom bench. One of the projects I'm working on this week is to produce a scarf for the Surface Design Association's upcoming auction. I'll be using a silk scarf blank to dye and paint. I'm looking forward to having fun with this, hope to get to it tomorrow. Just another busy morning in the studio! 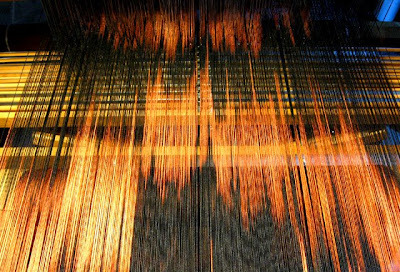 First warp length being painted, above. Then rolled up in plastic to make room to paint the second warp length. Second length being painted, before colors were added. I just finished weaving the two pieces I was working on -- a painted warp piece, above, for shibori and surface design, and a plain silk twill piece, below, for shibori and surface design. I stitched three photos together for the piece above, photos taken of the piece hanging on the gallery wall in my studio. The piece below was also hanging but I just took this closeup of it. So there are BIG projects in the works! The challenge will be working on these pieces because they're as long as or longer than my studio table! I see more table leaves in my future! The next weaving project will be another painted warp, which I'll paint tomorrow, which will be woven with the silk weft in the photo below that I discharged over the weekend. This was leftover dyed silk yarn that I used as weft on the painted warp I just finished, and I thought I'd try discharging it to use for painted weft. I've never done painted weft before, so the woven results should be interesting. I plan to use similar dye colors for painting the warp tomorrow. Discharging is a real mystery, by which I mean you never know what you're going to get. I'm just a little unsure about the colors in the weft, above, but I already have some ideas in mind for surface design on the woven piece. 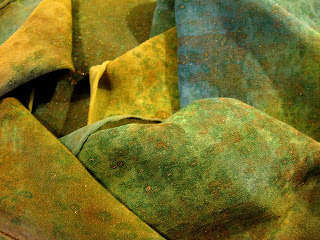 Besides, if all else fails, I can always overdye, or re-discharge, or paint, or distress -- the possibilities are virtually endless! This first image is of the hand tied raw silk piece I gathered yesterday and dyed. 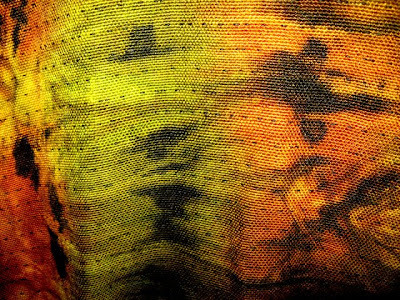 It was dyed with acid dyes. I've already started working on this piece but won't show it again until it's finished. The second piece is white linen, painted with a thin wash of Pearl Ex metallic pigment in watered down acrylic medium. 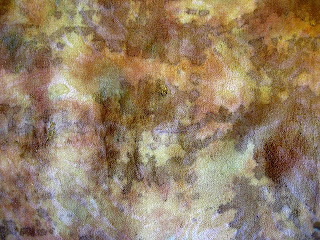 Third one is a piece of linen/rayon fabric that I painted yesterday with liquid watercolors and drawing inks, which were then steam set. Today I overpainted it with Lumiere fabric paint. 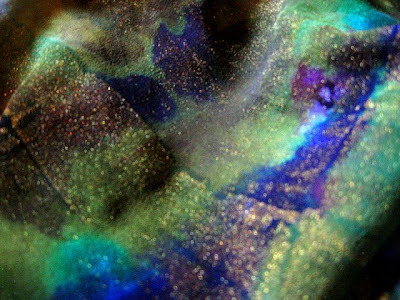 This next piece is a habotai silk that was painted with liquid watercolors and drawing inks, steam set, stencelled with Golden Liquid Acrylic paint, then finished up with the Pearl Ex in acrylic medium mentioned above. 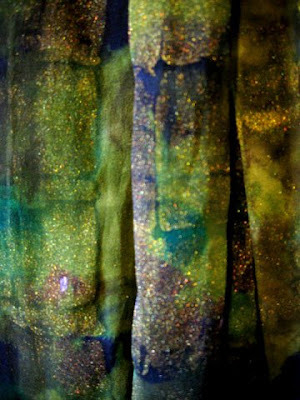 This piece is silk chiffon that was painted and overpainted with a variety of paints. The last piece is an "old" scarf that has had several iterations. 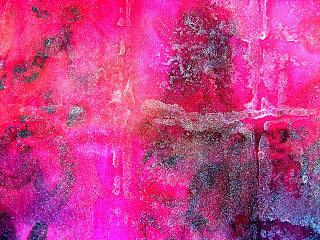 I bought the blank -- silk chiffon -- back in the early 1990s when I was painting silk -- but I'd never used it until a couple years ago. 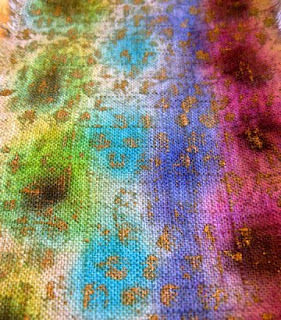 Then, right after I started doing woven shibori, I took this scarf and did some hand stitching on it, then dyed it the colors you see here. Today I overpainted it with Lumiere and a bronze acrylic paint, very diluted. The best part of all this is that I'm putting my fears aside and just going for it. There are no mistakes. Whatever I come up with, I'll work from there to create whatever wants to be expressed. I had assistance today finishing up hand stitching on a piece of raw silk that will be shibori'd. I've been working on it for several days now, but with BeeGee's help I was able to get it done today. Will dye it tomorrow and then do a number of surface design treatments afterwards. I'm progressing on my current weaving -- it's the same size as the painted warp piece, but because it's a twill design, it's taking longer due to the greater number of picks per inch than plain weave. So this piece is seeming to take a small lifetime. I am SO enjoying cutting stamps! Something that's so cool about it is that store-bought stamps are really expensive and it would cost a fortune to have a good selection of them. So cutting them myself is a much better deal. Plus, the store-bought ones, although I adore so many of them, are really too detailed to use well on textiles. So making my own is definitely the way to go. 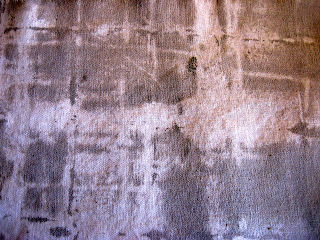 I dyed a small piece of raw silk the other day and experimented with salt on the dye -- which looked pretty okay until I steam set the dyes. Then the salty areas fairly well took the color out. No matter, I didn't like the color anyway and just discharged the entire piece this morning! I'm hand stitching it for shibori and have several ideas in mind for dyeing after the piece is gathered. I'm going to a re-wedding this afternoon, some friends renewing their vows on their 50th anniversary. How cool is that! Anyhow, I'm off to weave for a while. Have a good weekend!